A recently refurbished semi-detached cottage located on the edge of Burton-in-Kendal in the popular South Lakes. 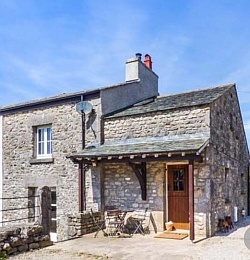 This old farmhouse has lovely period features and some quirky modern ones with contemporary artwork; from a funky coloured shower tray to the stunning large stone fireplace and woodburner, complemented by button-back leather chairs with claw feet and the stone-flagged entrance and kitchen with beams. A large comfortable bed await you in the master bedroom, and a bathroom boasting a free-standing bath to soak in, or a contemporary shower room. In the sitting room there is a large corner settee to relax on in front of the woodburner for those cosy evenings in, or why not throw open the French doors and enjoy your favourite drink or meal on the patio while enjoying the ambience of the countryside, and watching the farmer's cows and sheep in the paddock. This is an ideal holiday location for all seasons, whatever your requirements. Note: This property can be booked with Oakwood Farm West, together they sleep 9. With adjoining door. Notes: There are four stone steps from the kitchen to the sitting room. We look forward to welcoming you to Oakwood Farm East. Read what our guests say about Oakwood Farm East on TripAdvisor.